The contemporary world is characterised by complexity and rapid change, affecting also the profession of interior architects and spatial designers. The Interior Architecture programme is based on the principle that a set of design skills, in the narrow sense of the term, is not sufficient for interior architects to be successful in their profession. They also need to understand the broader context and be able to adjust their solutions to changing situations. The first (so-called ‘hi-tech’) segment deals with the interaction between spaces and people, and the ways high technology and smart materials help improve that interaction. The second (so-called ‘low-tech’) segment is based on the notion that if we have good knowledge of our surrounding, broader contexts (such as climate, nature, economy and culture) and their interrelationship, rich imagination and primitive materials are all we need to create fresh, quality spaces. During the first academic year, students participate equally in both segments. The second academic year is dedicated to the Master’s project. For that, students will select one of the two segments — whichever better supports the topic of their project. 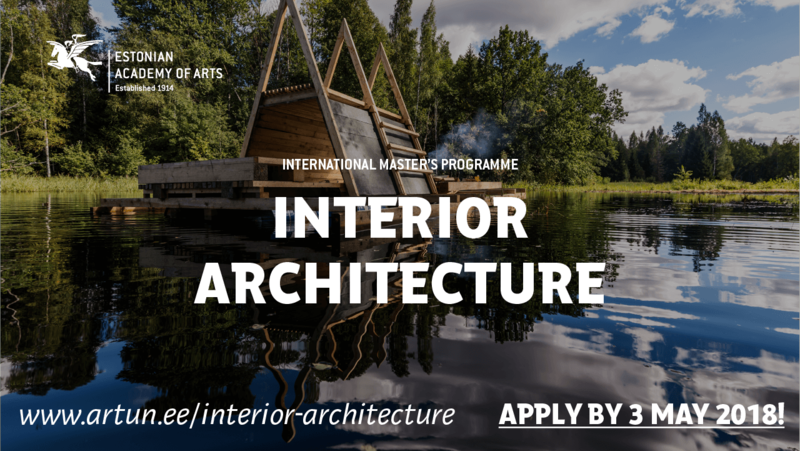 The overall objective of the Master’s curriculum is to prepare an independent creative person who is able to create personalised three-dimensional environments, combining architecture, design, art and technology into a coherent whole and lead the implementation of their spatial design projects. The curriculum provides the skills to analyse critically, develop and experiment with the different aspects of spatial environment creation and helps to develop a personal, creative approach. It focuses on providing in-depth theoretical knowledge and the practical skills necessary for qualified professional work, with the aim of preparing students to create spatial design projects independently. In developing these skills, students will benefit from the unique context of Estonia: its harsh northern climate; extensive, unspoiled nature; its location on the border between East and West; its small size. Copy of your Bachelor’s degree certificate or equivalent and its translation into Estonian, English or Russian (both, copies and translations have to be attested by notary). Copy of your Transcript of records (and translation into Estonian, English or Russian; both copy and translation must be attested by notary). Portfolio – submit in pdf format with application papers. Please present spatial design projects, minimum amount of five. Add supportive renderings, drawings, photos, diagrams and texts. Essay on possible MA thesis topics (max 1500 characters, pdf format). Add visual materials if needed. Short video of a spatial intervention carried out by the applicant in public space, with the goal to draw attention to a common spatial problem. It is important to showcase the essence of the problem before intervention, the process of the intervention and the possible change created by user reactions. Both indoor and outdoor problems can be investigated. The amount of material used for the intervention is not important; the clip will be assessed on the relevance of the problem selected and how comprehensive is the summary of the results. If needed, diagrams, text, or other visual material can be used in the clip. The message of the clip is more important than the production; material filmed and edited with mobile phone is also suited. Please upload the video up in YouTube, Vimeo or other video-sharing site and provide a link to the clip in your essay on 3rd of May the latest. For additional information regarding admission, please contact admissions@artun.ee. More information about the programme can be found: https://www.artun.ee/en/curricula/interior-architecture/.